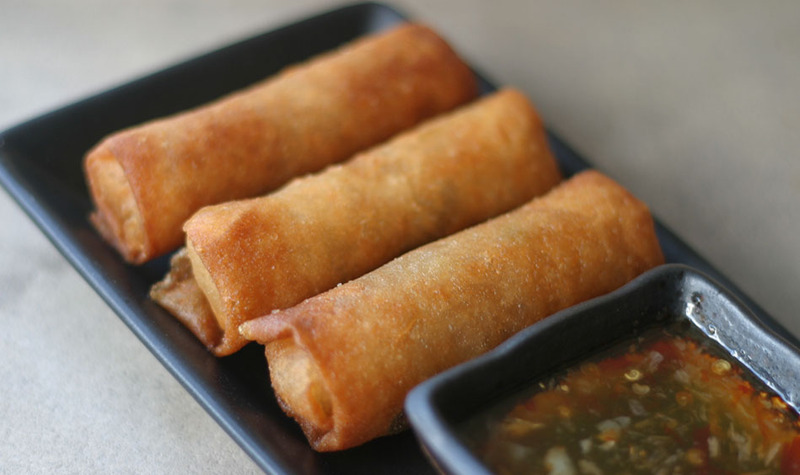 Fried Spring Rolls are usually found sold on the street in Thailand. Typically, the vendors who sell them in Bangkok also sell deep fried tofu triangles, fried shredded taro cakes, fried shredded turnip cakes and fried corn cakes. You decide which ones you want (you can mix them) and the vendor dumps them in a bag, tops it with sauce and gives you a wooden stick to eat with. You can also get spring rolls at some restaurants, usually of Chinese-Thai origin. The restaurant version usually is a lot nicer, with shredded vegetables and meat, sometimes seafood. There is another variety of spring roll which has one shrimp inside each roll too. Submerge the dry mushrooms in water and soak for 2 hours. Squeeze out the water and slice the mushrooms thin. Keep the water for cooking later. If using frozen wrappers, you’ll want to de-thaw them now too. Soak the bean thread noodles for 10 minutes in room temperature water until soft. Remove from water and cut the mess in 1/2. Fry the mushrooms with 1 tablespoon of oil, 1 tablespoon of the oyster sauce and 2 teaspoons of the white soy sauce on medium high heat for about 5 minutes. Keep adding the mushroom water (which you soaked the mushrooms in) as it gets dry. Set aside. Fry the garlic in a bit more oil until fragrant on medium-high heat. Add the noodles, mushrooms and the rest of the sauces. Stir well to mix. Add the scallions and pepper. Remove and set aside. Let cool until room temperature. Wrap the wrappers as shown. Put about 1-2 tablespoons of filling inside. Seal with egg, water or wheat flour paste. Wheat flour paste can be made by combining a small spoon of wheat flour with water. Deep fry on medium high heat. The oil should be dancing (you’ll see it move) but not smoking. Remove and let dry on a wire or mesh rack to keep it crispy. Make the sauce by smashing the chili in a stone mortar and pestle, and mixing with the vinegar and sugar. Simmer over low heat until thicker, about 5 minutes. Thai spring roll wrappers are similar to Chinese egg roll wrappers in that they are made of wheat and not rice. They are not the same as rice-paper Vietnamese spring roll wrappers. Do not substitute with rice paper wrappers if you want authentic Thai spring rolls. You can usually buy Thai spring roll wrappers frozen in SE Asian Markets. Black mushrooms (shittake) are easily bought dry. You can soak them to make them soft again, but keep the water to cook with. The amount of oyster sauce depends on your brand. Thai brands are not as salty as Chinese brands. 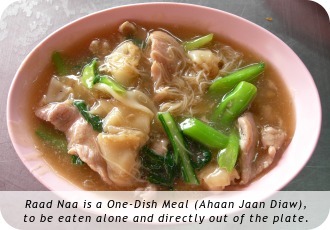 If you're using Chinese, lessen the amount called for in this recipe. Make sure your wrappers and rolls don't dry out when you're rolling. Keep a damp cloth over the wrappers and finished rolls while rolling. You can freeze un-fried rolls in an air-tight container and fry another day. When I make spring rolls, I tend to make a large batch and freeze them for later. When frying frozen spring rolls, fry one at a time. They're ice-cold and you don't want to cool down your oil too much. If the oil is not hot enough, you get greasy soggy spring rolls. Yuck. Feel free to dress it up a bit by adding any of the following before frying the noodles: shredded cabbage, bean sprouts, ground pork or ground tofu. 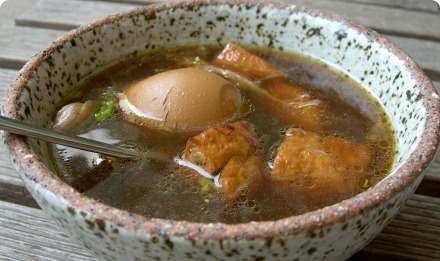 You may need to add more oyster sauce & soy sauce if you add more filling. umm i wanted egg rolls not spring rolls…are they the same thing?